The Magical Forest I: 945,- Euro !!! The Magical Forest II: 900,- Euro !!! 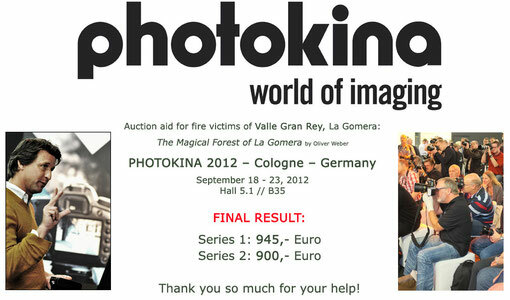 The project: Fotocommunity was proud to be a part of a project - during the PHOTOKONA 2012, the world's largest trade fair for the photographic and imaging industries - which was designed to help the residents of Valle Gran Rey and the recovery of the Garajonay National Park. Both Valle Gran Rey and the Garajonay National Park are situated on the La Gomera island in the Canary Islands which were impacted by the large forest fires on August 2012. During this time almost 1000 residents of the Valle Gran Rey had to be evacuated form their homes over night. Upon the suggestion of one of the members of fotocommunity, who is also a resident of La Gomera, this auction is designed to raise money for the residents of this area, to help them recover from this tragedy, and to try recover the Garajonay National Park which has also been impacted by this tragedy. All the money raised will go for this cause. Pictures: These pictures come from a photo series called 'The Mystical Forest'. They were taken by Oliver Weber, in the Garajonay National Park, which is part of the UNESCO World Heritage. They portray what is called a laurisilva or a laurel forest. These forests are typically found in subtropical locations with high humidity and are considered to be in existence for millions of years. Such types of forests are very rare, especially in Southern Europe and Northern Africa. They contain various vegetation such as evergreens and hardwood trees which can grow as tall as 40 meters. The photographer: Photographer Oliver Weber is a valued member of the fotocommunity. He currently lives in La Gomera with his wife Alexandra, where they both work as doctors.